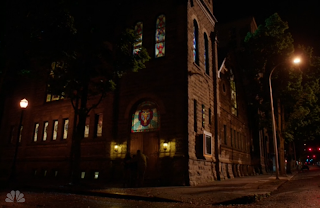 Grimm Episode 306 "Stories We Tell Our Young"
Filming of the opening scene took place at St James Lutheran Church located at 1315 SW Park Ave. The church is 125 years old and on the National Register of Historic Places. 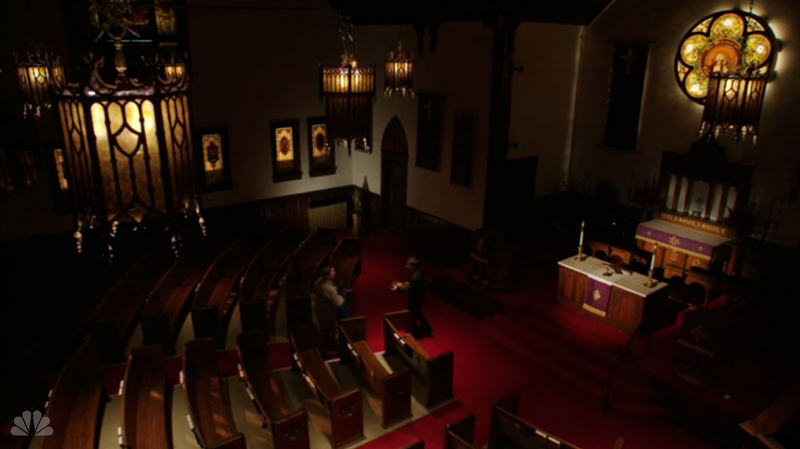 The attempted exorcism of a little boy was interrupted when he turned Wesen and attacked the priest and seminary student. The boy and the seminary student were sent to "St Joseph's Hospital" after the incident. It looks like Good Sam's Hospital played host to Grimm again. Spice Shop - MonRosalee explain the Wesen birds and bees. Nick & Juliette's - Juliette racks her brain about parasites. The team ends up out at Daniel's house, chasing Daniel out the back door through the forest to his fort. This location looks like it opens into Forest Park…anyone have insight on this location filming? Thanks to Juliette's veterinary expertise, the parasite mystery is solved, the offending parasite dies when the boy best hypothermia, and then the boy is cured.